One of our Etsy customers asked me for a special order a couple of weeks ago, and it was a really great idea. I have full-sized coffee cups in the shop that are large enough to hold a package of cocoa or tea mix. She wanted to know if I could make a miniature version that would hold a gift card. My mind whirled - well, of course I could! So I shrunk my pattern (let me know by email if you'd like one). 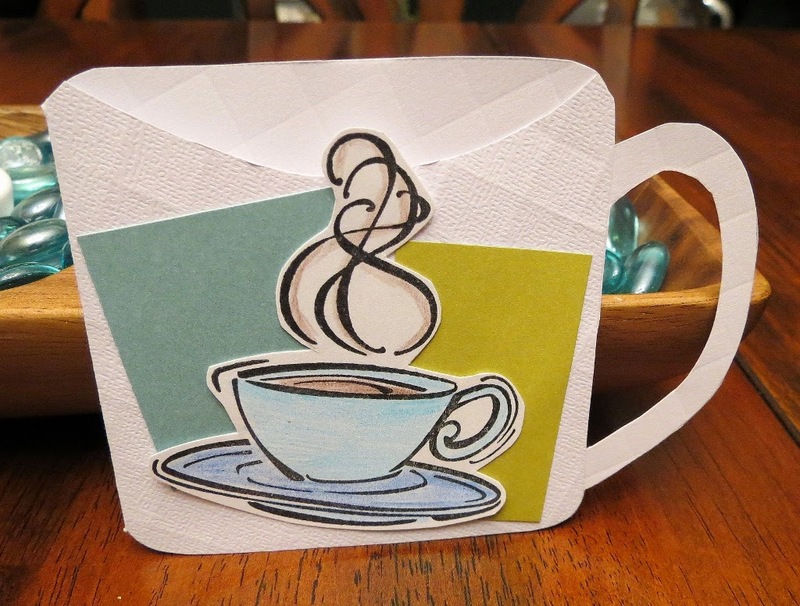 Then I hand-embossed the white card stock that she was looking for and cut out 20 cups. She wanted a coffee cup image, so I stamped and colored 20 of the images you see here. A little background color and it came out amazing! Take a look at one of your crafts - one that you make all the time - and see if there's something new and different you can do with it. You might be surprised at what you're missing. Come visit our Etsy shop at www.stufffromtrees.etsy.com.